Even though the most recent trip we took was to Washington DC I still haven't transferred my pictures to the computer. I was looking through my pictures from our trip to Seattle WA today in between some work. 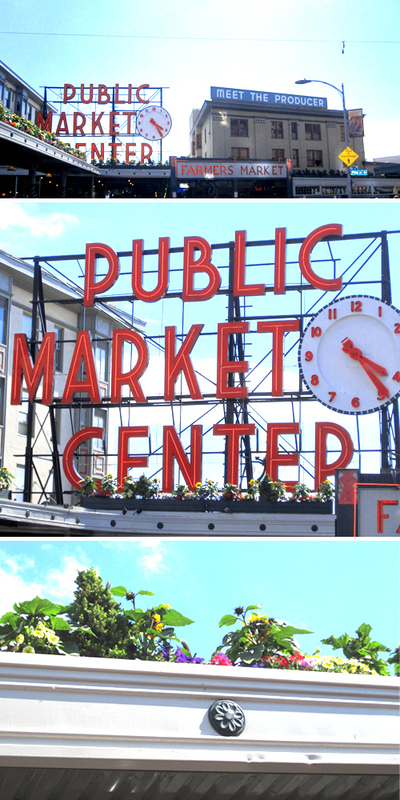 One of the to-do things in Seattle is Pike Place Market down by the water. It's signage is iconic as is the fish market where the fishmongers are theatrical and throw fish. We were there on a really gorgeous day on a long weekend so it was very, very busy. Great produce, fresh flowers and arts and crafts for sale plus of course the first Starbucks store! I really liked the floral border running along the top of the building.